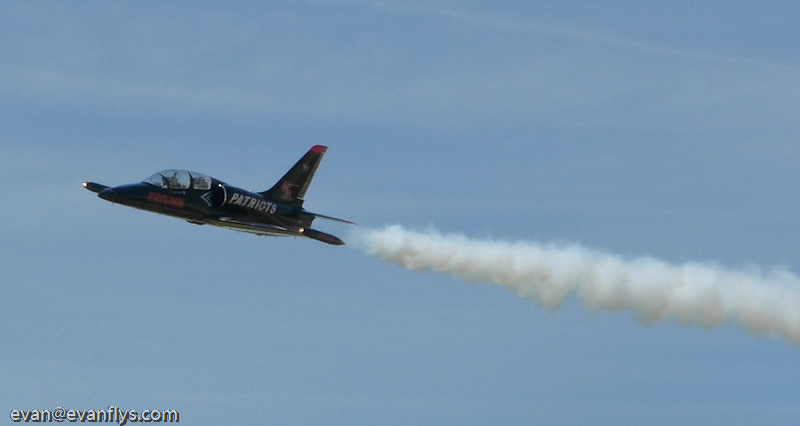 Dean "Wilbur" Wright flies the number one position in the L-39 equipped Patriots Jet Team. I've always loved watching the Patriots perform - especially their amazing tail slide! Before joining the Patriots, Wilbur flew with the USAF which included combat mission over Iraq in an A-10 Thunderbolt, and two years with the awesome Thunderbirds! I had a lot of fun interviewing him and I hope you like reading it! Were you into flying as a kid? 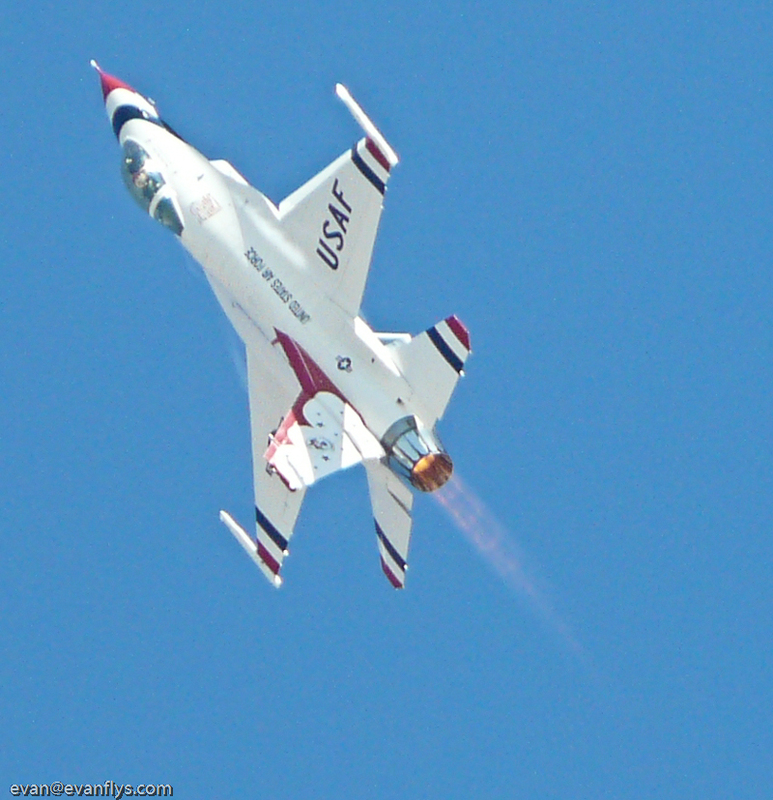 I was into flying and into airplanes but I got into them because I saw a Thunderbird demonstration when I was a little bit younger than you and I saw them in Austin Texas when I was seven and that's what inspired me to fly. And truly, that was my dream, to become a Thunderbird. Well see now there's the thing; even though I was into flying, I never did actually pursue flying as a child. I pursued becoming an Air Force pilot. My first solo was when I was 18 years old at the Air Force Academy. So that's when you got your pilots license? No, kind of surprising but I didn't pursue a pilots license because in the Air Force you don't need a pilots license. I didn't have a license for my entire career. I didn't actually get a license until I started flying for this team, the Patriots Jet Team, in 2004. Why did you choose the Air Force over the Navy or the Marines? Well who flies the Thunderbirds?! That was my decision making - pretty simple! How did you get to fly fighters? It's quite a selection process when you go through pilot training. How well you do in pilot training dictates whether you go to fighters or if you go to fly other aircraft. And so I tried hard, as did all 50 of my classmates, but I was fortunate enough to finish near the top of my class and was selected to fly fighters. You must've been a very good pilot to get into the Thunderbirds. Did you practice a lot and was it hard to qualify? First of all, I wouldn't say that I was any significantly better than other pilots to make the Thunderbirds. Here's something that a lot of people don't know about the Thunderbirds and the Blue Angels; that those guys are pretty fair representations of all the fighter pilots that are in the service. There are a lot of fantastic fighter pilots. 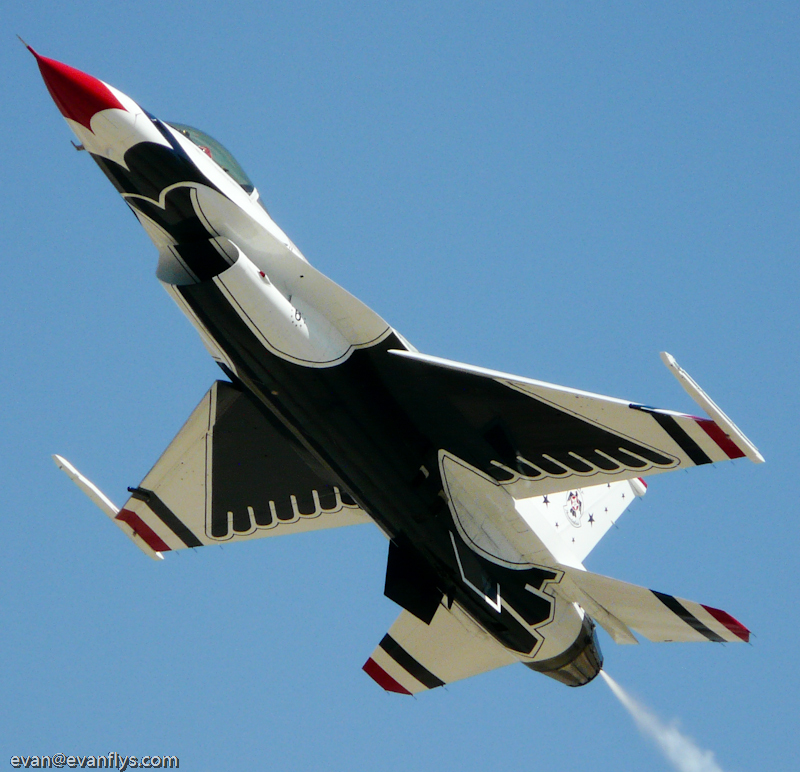 There are a lot of fighter pilots that are much, much better than me that didn't want to be a Thunderbird. I don't want anybody to think that since I was a Thunderbird that I'm any better than anybody else because that's really not true. But it was hard to qualify; it was hard to fly for the team and to make the team. They get about 50 or 60 applicants a year and then they only choose three. But what it really boils right down to is they choose those guys based more on their personality. Because by the time you get to those top 10 guys their flying skills are all relatively equal. What kinds of planes have you flown? Well I started out flying the A-10 Thunderbolt and that was a very cool plane. It was one of my favorite airplanes to fly. In fact I still have most of my time in the A-10. I flew that in England, in Korea, and in Desert Storm as well. And then after that I flew as an exchange pilot with the Royal Air Force flying Harriers, the jump jet. That one was one of my favorites also because it was the most challenging airplane I've never flown. It's just a really difficult aircraft to fly. Following that I flew T-38’s as an instructor and what made that tour a little bit different was that I was teaching Taiwanese pilots and so there was a language barrier to work with and we were teaching them air-to-air. I'm not an air-to-air pilot. I'm an air-to-ground fighter pilot. Yeah, I was more of a shoot the guns, drop the bombs pilot, as opposed to shoot the missiles. So it was a great tour for me, flying in the T-38, to learn about air-to-air. And then after that tour I flew the Stealth Fighter, you know, the F-117, which is now retired. That was an incredibly interesting assignment, flying the Stealth Fighter, because you get read into a lot of secret programs. The airplane itself was not nearly as exciting as say the Harrier or the A-10. Then following the Stealth fighter was when I got my assignment with the Thunderbirds flying the F-16 and that truly was the Ferrari of the fleet. It was definitely flying a sports car. And that's all I flew. You think you could tell me some combat stories like during Desert Storm? Sure. My squadron flew out of Turkey into northern Iraq and our job was to provide relief to the Kurdish people. They were driven into the mountains in northern Iraq by Saddam Hussein and they were starving up there. They weren't living in houses; they were just living in the valleys and living in makeshift tents and whatnot. They were starving, they didn't have fresh water, and they didn't have blankets. And so we were bringing in C-130s to drop a lot of supplies to them. The A-10's were there to protect the C-130s and to make sure that the supplies got to the Kurds and not to the enemies. It was an exciting time to fly because it was such a desolate environment, there weren't any navigation aides like we’re used to here. So often times, for instance, we had to penetrate weather to get down into the valleys in order to find the Kurds but I didn't have the luxury of Air Traffic Control providing me radar coverage for a safe cloud penetration, so in order to let myself down through the weather we actually had to make TACAN (Tactical Air Navigation) cuts and let ourselves down through the weather and into the mountain valleys without talking to air traffic controllers. So it was a little bit of a touch and go time. But fortunately, if I was shot at no one ever hit me. By the time I flew, the A-10's had quite a reputation for shooting back! And so the Iraqis weren't much into shooting at A-10’s. The C-130s took a few hits and some of our Navy brothers took a few hits but the A-10’s went unscathed. Can you share some cool Thunderbird stores? There was a great show in 1999 at Chicago. Chicago was a fantastic show because there were so many unique things about it. It’s got the really tall buildings and it's also an over water show which gives it an added level of difficulty because when flying over water there's no depth perception. So, you could be flying at 10 feet but it looks like you're at a hundred feet. The amount of people in Chicago is just breathtaking; there are so many people along the coastline. I remember flying one of the shows there and the weather was kind of low. In fact, the weather was so low that the cloud ceiling was actually covering the tops of the towers. I would normally fly over the towers to maintain my normal flight path for the show, but with the clouds so low my flight path took me in between several of the buildings. So I was having to drop down and stay below the weather but also I was flying right between the Sears Tower and its neighboring tower. The first time I went by, on the lower platform of the Sears Tower, was a couple of guys out there in business suits and drinking a cup of coffee, and as I went by, they waved at me so I waved back. And on the second pass I come by there’s those two guys and about 10 of their friends. And by the end of the show there are those two guys and there must've been 100 people on that balcony! There were so many that the Sears Tower was leaning! Wow! 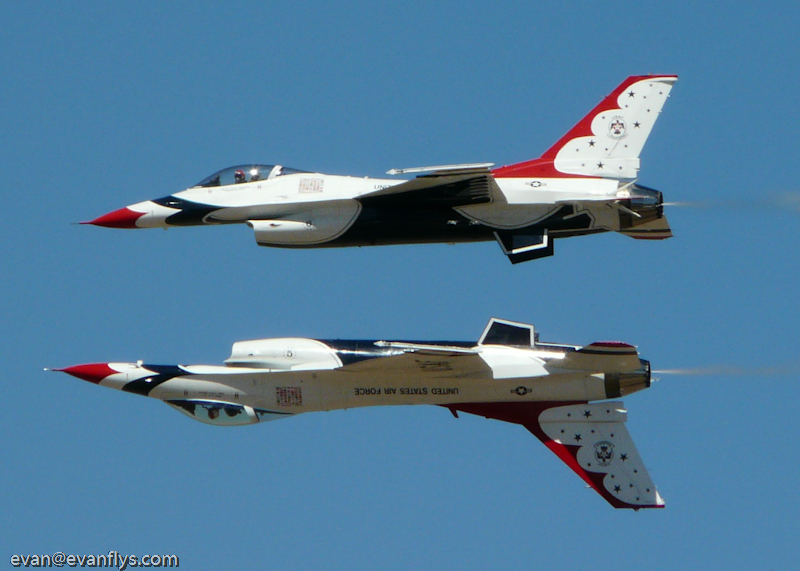 So how did you like flying with the Thunderbirds in all your shows? I loved it. It was a dream come true for me, like I mentioned before. That was purely what inspired me to become a pilot in the first place… to be a Thunderbird. So to actually have a chance to live out my dream was unbelievable and it was it went too fast. I wanted to slow down time because I didn't want it to go too fast. But that didn't work and the time did go by very quickly for me. If I could turn back time, I would do it all again. Why did you leave the Air Force - did you retire? I did retire. I spent 20 years in the Air Force and the reason I retired is just because it was time. It was time for me… it was a very personal thing. There was nothing based upon any outside influences really. It was mostly a lot of internal influences within me and with my family. I've got a boy about your age and I want my boy to grow up with a hometown similar to what I had when I was growing up. I wanted him to have a hometown. He can't really do that very well in the Air Force because you move so often. So that was one of the influences for me to get out and retire. And plus, I had a really nice job that was waiting for me on the outside and that is flying for Fry’s Electronics. How did you get to join the Patriots? The Patriots, well, I first became acquainted with their owner, Mr. Randy Howell, when I met him at the Reno Air Races in 1999 when I was a Thunderbird. I was Thunderbird number six and he was flying two red MiG-17’s called the Stoli MiGs and he and I became good friends. Fast forward about 5 years and in 2004, he called me up and said, “Hey Wilbur, are you interested in coming out and flying lead pilot for a new team I have called the Patriots?” And so I thought about it for about 10 seconds and immediately accepted. And so I came out here and got checked out in the L-39 and immediately started flying that very next season. Do you like flying the L-39? I do. It's a fun little airplane. It's a trainer. It's a two-seater so normally the student pilot sits up in the front and the instructor sits in the back and you’re teaching a guy how to do advanced flying. They’re not learning to fly an airplane, they're learning to do advanced flying so it handles really well and it’s very forgiving. It somewhat talks to you Evan. Before it does something it'll let you know that it's going to do it. Like if you stall it, it will talk to you a little bit; if you get too fast, it'll talk to you a little bit; if you go to slow, it talks to you a little bit. I wish it was a little faster but other than that, I really enjoy the airplane. Do you like flying with the Patriots? Is it a good environment? Love it! It's a fantastic environment. In a lot of ways it's a better environment than the Thunderbirds was. 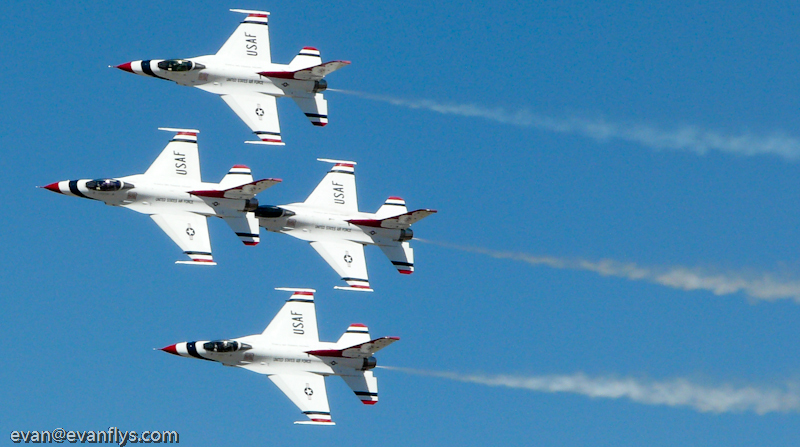 The Thunderbirds was very regimented military squadron. And it was very big, there were 120 people in that squadron. In the Patriots we have four airplanes and we have about 25 people that are involved with this team. It's a big group effort; everybody's a volunteer so everybody that's here really wants to be because nobody's getting paid to do this. For me personally, it gives me a way to use those skills that I developed in the Thunderbirds so that dream of becoming a Thunderbird pilot now lives on with me being a Patriot pilot. Can you share some cool Patriot stories with us? You know I think one of my favorite Patriot stories was my first practice with this team. 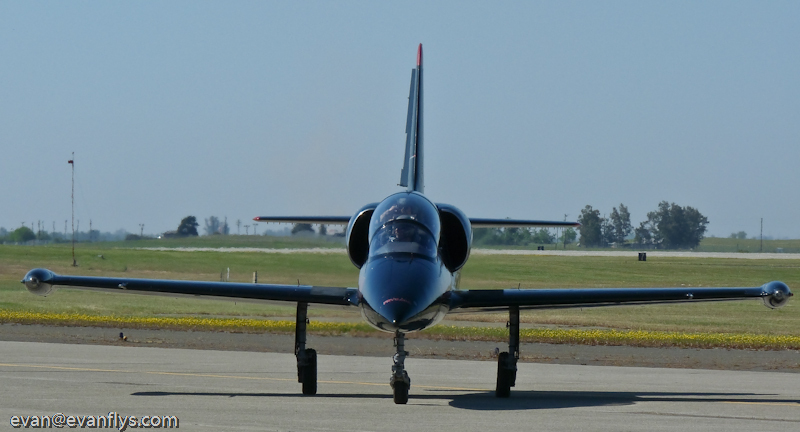 I came and I got checked out in the L-39 and after maybe three hours in the airplane, I was flying formation with guys on my wing, going out to the practice area to do a couple of practice loops and rolls. I had not flown in about four years because I'd been on a staff job as an officer, and it didn't include flying. So I was kind of worried about how I would do with that long of a time off from flying. And it was incredible Evan… how fast those skills came back. It's very cliché but it was like “riding a bicycle” and I was amazed at how natural it seemed. I just felt like I'd never stopped flying demonstrations the first time I got into the airplane. How did the Patriots first get started? Well Mr. Howell had the Mig 17’s and after the 9/11 catastrophe the sponsorship for that team disappeared and so he wanted an airplane that was a little more marketable for sponsorships and along came the L-39. It's a very affordable airplane. It's a very safe airplane. It's a very efficient airplane. It doesn't use a lot of fuel and it's easy to maintain and it's easy to fly. It's the perfect airshow airplane. So he bought a bunch of them and shipped them over here and as you can see in this hanger, is putting them together by hand. He, hands down, puts together the best L-39’s in the country. And I think that anybody that knows anything about these airplanes would agree with me on that. They're incredibly well-built airplanes. And that's how the Patriots started. He started with a two ship in 2003 and then I came along in 2004 adding a third airplane. We did that for two years and then in 2006 we added a fourth airplane. And now guess what were doing next year? Adding two more! Exactly! We’re very excited about that. As you can see in this hanger, we have the very next two L-39 Patriots being prepared. Number five is right there and it's very close to being complete. It should make its maiden voyage in about two weeks. And then you're sitting right next to number six. It's a little bit further behind but it will be well ready for the 2010 season. What we've got to do between now and then is find two pilots and the money to fly the airplanes. So those are our two big challenges. As much as we love to do this, it's not a cheap hobby or business. So we've got to find a company or an individual that has the passion for flying like we do and who would be willing to sponsor this team for these additional two airplanes. Can you tell me about flying with the Patriots? It's a unique team. We don't want to be compared to the Blue Angels or the Thunderbirds because we’re a very different team. First of all, there are only four of us even though we have a plan to become six. Even with six airplanes, we don't want to be compared to those other teams. It's a very different style of airshow we do. 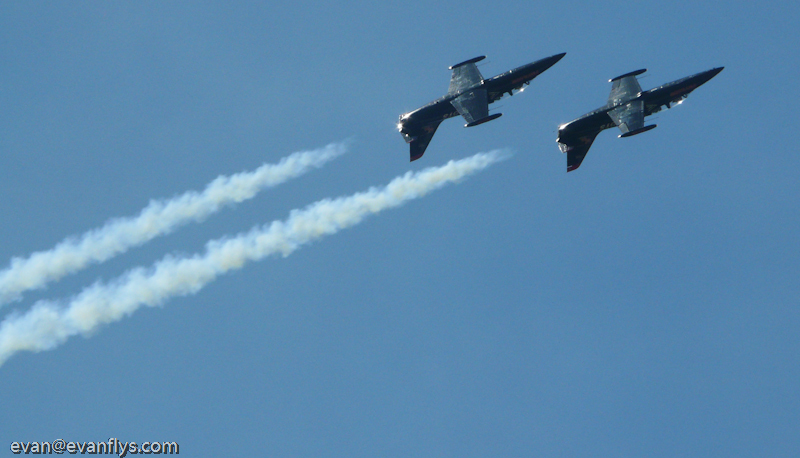 With the Blue Angels and the Thunderbirds, they have the classic diamond and two solos. We’re not going to fit that same mold. So you're basically going to see six airplanes all doing six different things. We may pair them up so that you'll have three pairs of airplanes. And because of the nature of this airplane being a little bit slower and having a turning radius that will practically turn inside this hanger, the whole airshow stays right in front of the crowd. 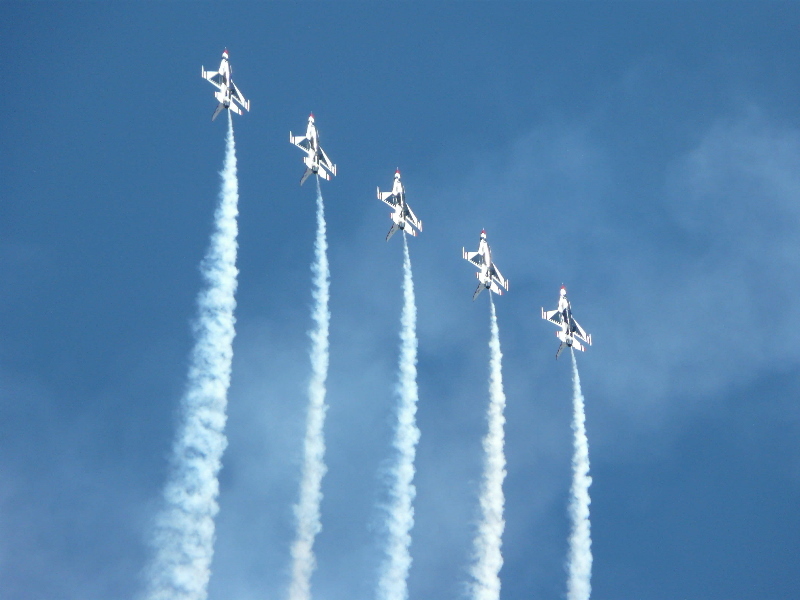 When you watch the Thunderbirds or Blue Angels show, they disappear for about a minute and a half after each maneuver and then they reappear… and that’s because of their speed. Well because of our slower speed, we keep everything right in front of the crowd so that the noise and the activity and excitement and all the adrenaline are focused right there in front of the crowd the entire time. We also do a couple of maneuvers that those teams don't do and one of them is the tail slide. Have you ever seen us do a tail slide? Oh yes, it’s pretty cool! The F-16 and F-18 don't do that, but we do and I think it's a really exciting maneuver. How do you pick pilots to become Patriots? Good Question. It’s very similar to the way we picked them in the Thunderbirds. There a lot of guys out there that are qualified to do this but it really boils down to whom we get along with. The Patriots are more than just a team… we’re a family. We enjoy spending time together and hanging out with each other everyday while we’re on the road. So we need somebody that we’re looking forward to hanging out with, someone we want to join us as a member of this family. The two guys that we hire will most likely be ex-Thunderbirds, Blue Angels or maybe an ex-Snowbird because they already have the skills that we need to be able to do this. And they're probably going to be people that we already know just because we already have an idea of what their personalities are like. How many shows do the Patriots do this year and how many will you do next year? Historically we do between 9 and 12 shows a year. You got to remember Evan that this is a hobby for pretty much everybody. We all have full-time jobs that we have to do. I myself am a corporate pilot for Fry's Electronics. Our number two man, Rob Hutchison, is a contract pilot. He flies 727s and 747s for Fry’s Electronics and he's a bush pilot up in Alaska. Our number three pilot, John Posson, is an instructor pilot in the P-51 Mustang for Stallion 51 in Florida. That's his full-time job. And then our number 4 pilot, Paul “Sticky” Strickland, is our other ex-military pilot who was also a Thunderbird. “Sticky” is a Southwest pilot and lives in Salt Lake City, Utah. So as you can see, we all have full-time jobs and that's just the pilots. Add to that all the maintainers and all the support personnel who have full-time jobs too. So it takes quite a bit of effort in order for us to put on a show. We would love to do 20 shows a summer but it would take up so much time that we’d all get fired from our real jobs! Well you don't want that! Thanks so much for the great interview Wilbur! You’re welcome Evan and thanks so much for making the effort to come out and see us. Yeah, I had a great time! 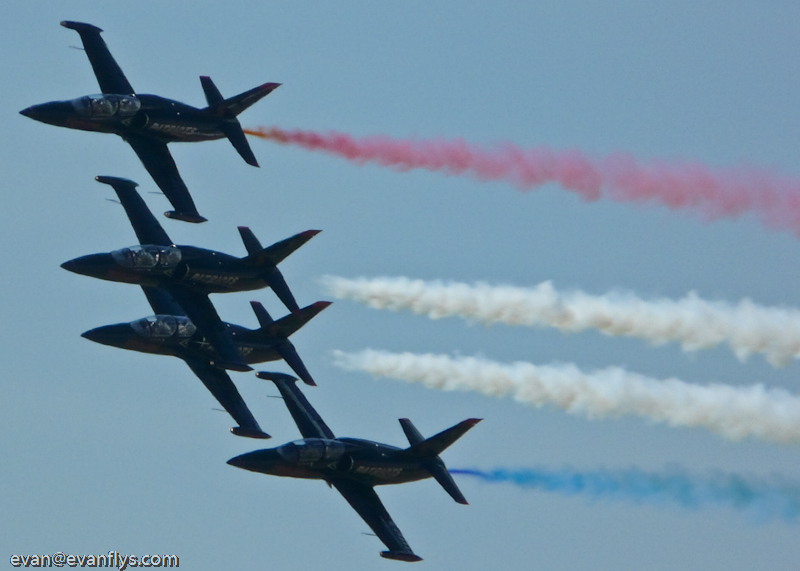 If you ever have a chance to go to an airshow where the Patriots are performing, you HAVE TO GO! They are incredible!